The difference between a single degree of a propeller blade can drastically affect the performance of a boat on the open ocean. Having a propeller that fits your craft's needs makes for a smoother and more productive seagoing experience. Ambush propeller models have long since been an industry leader in accuracy for a boat's performance. First introduced during the mid 1980s, these prop machines were used for huge yachts that needed specific consistency in their propeller functions, necessitating complex designs and engineering in order to get the details right. While this technology is still used in multi-million dollar vessels, you can get it for your own towboat and get the same power and performance as a major ship. 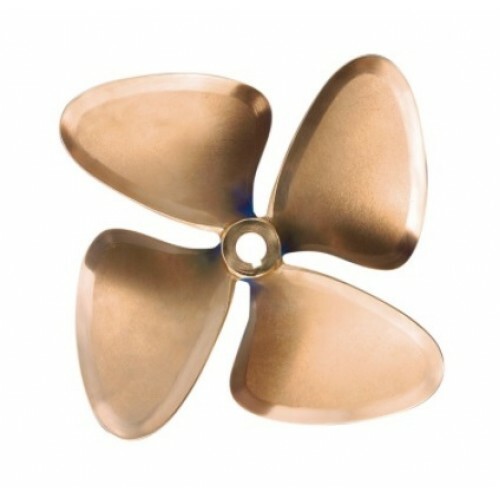 Deep Blue Yacht Supply carries the entire line of Michigan Wheel Ambush ski propellers, and can ship them world-wide. Reach out to the experts at Deep Blue Yacht Supply to order your Ambush ski propeller today. Ambush propeller systems are manufactured by Michigan Wheel Marine, an industry that has been constructing watercraft parts for well over a century. Their products are used on a wide range of boats, everything from three-inch to ninety-six inch propellers, meaning that they cater to every size boat, from a simple dinghy to a massive freighter. They manufacture both aluminum and stainless steel propellers, meaning that an Ambush propeller can be constructed to your specifications: if you would prefer higher speed and less weight, you can browse through aluminum models. Conversely, if you need better performance and greater durability, a stainless steel prop may be the choice for you. An Ambush propeller meets the needs of any professional or amateur sailor. If you want to get a low-pitch prop in order to troll better along a current, there are designs to help with your boat's performance. If you want to water ski on a nearby lake, you can use a four-blade propeller that serves water sports better: the higher prop means that the engine will not meet maximum performance, either overloading the engine or reaching a lesser RPM, resulting in less power that prevents a water skier from getting up and off the water. If you are thinking about changing a propeller, you should know that the stock prop included in a boat tends to be a compromise -- it has a fixed specifications that limit its use. Ambush propeller models can deliver superior performance. Reach out to the experts at Deep Blue Yacht Supply if you have any questions on Ambush ski props.